Every year, on August 11, Pakistan officially observes the National Minorities Day to honour the services and sacrifices, rendered by religious minorities for the country over the years. This very day also recognizes the contribution and sacrifices of Minorities .On this occasion, events, seminars and social gatherings are arranged across the country by members of various religious minorities and the ministry of National Harmony .The Government of Pakistan declared 11 August as National Minority Day in 2009. It is mentionable that in accordance with the vision of Quaid-e-Azam, the Constitution of 1973 protects the real rights and interest of minorities, living in Pakistan. In 2014, Shahid Mairaj, the Dean of the Cathedral stated in his message, on August 11, “The governing principle is to let people of every faith live in peace as they choose, and understand that the state belongs to everyone. This country is our mother, and it is a duty for all of us to help it to advance and flourish.” In this regard, the then Member Punjab Assembly and minorities’ leader Najmi Saleem remarked, “Minorities in Pakistan have exactly the same rights and responsibilities as other citizens”. He acknowledged by pointing out, “Many steps have been taken by the Government for the protection and promotion of minorities like the reservation of 5 percent quota in Government jobs/services, enhancement representation in the parliament, declaration of August 11 as the Minorities Day, including observance of optional holidays and celebration of the festivals of minorities at official level”.A Sikh leader, SardarBishan Singh shared similar thoughts and pointed out that all citizens of Pakistan worked together for the growth of the country. Last year, leaders of various religious minorities also expressed their positive thoughts in their messages in relation to the National Minorities Day.It is notable that the Ministry of National Harmony was formed after the devolution of Ministry of Minority Affairs to acknowledge the sacrifices and services of minorities to promote peace, patience and tolerance for creating an understanding and brotherhood among the people of different schools of thought. However, since the formation of Pakistan, minorities are contributing in every sphere of life and their political involvement is also worth appreciating. Therefore, the day is dedicated to the minorities who played their constructive role in Pakistan.But, at the same time it is regrettable that in the recent years, there were a number of terror-attacks on Minorities . 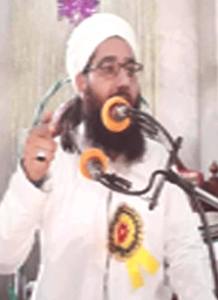 Syed Ishfaq Bukhari is A Religious Scholar from Central Kashmir.